At Greatmats, we carry a variety of different landing mats in two thicknesses: 12 and 20cm. You can choose either non-folding or single-fold competition landing mats available in standard blue. We also provide custom competition landing mats made to your specifications by a leading national manufacturer. All of our competition landing mats are made in the USA. They are covered with an 18 oz, matted vinyl which is the standard for competition requirements. There is no loose foam in our covers. All of our landing mats feature a double-stitched top edge and a number 10 YKK molded zipper. They come with 2” polyester web handles so you can easily move them. Hook and loop fasteners come standard on all four sides. 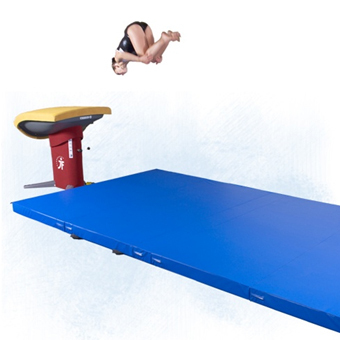 These mats are durable and built to last in school gymnastics programs or in professional training. Please note that NO gymnastics mats can provide a perfectly risk-free environment for gymnastics training. Gymnastics is a sport that requires discipline and knowledgeable instructors. Equipment needs to be checked and maintained regularly. Excessively dangerous maneuvers or gymnastics moves that are beyond the skill of the gymnast can result in serious injury. As a rule, the more gym matsthe better. It is definitely better to have too many mats in your facility than not enough.